Hi everyone! 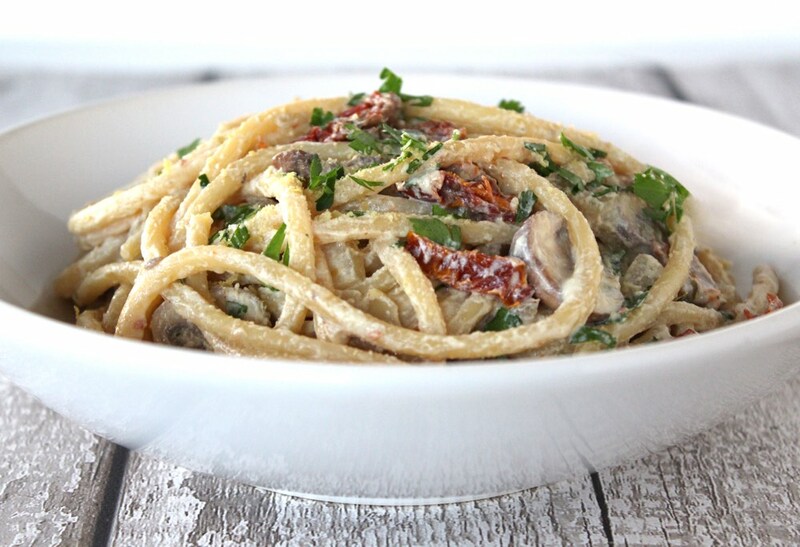 Today, I’m sharing a delicious vegan twist on the traditional pasta dish ‘Carbonara’. 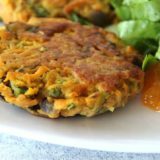 It’s really easy to make and takes just 20 minutes from start to finish, making it perfect for any night when you need a quick meal on the table. 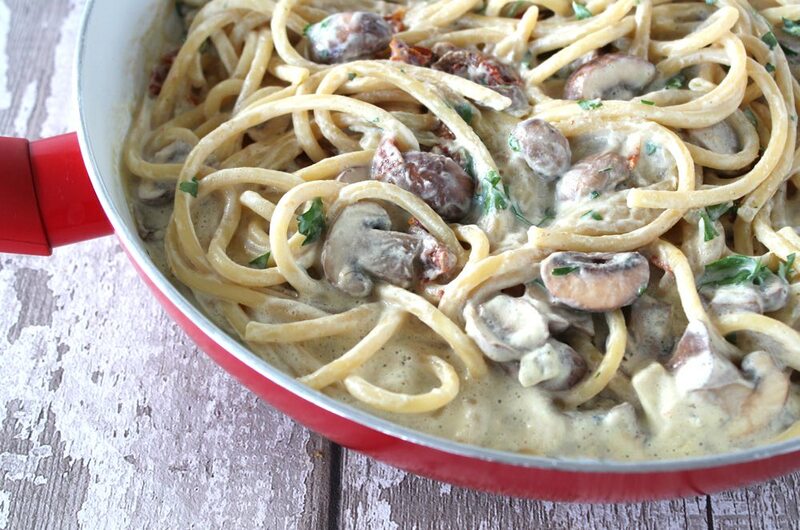 Carbonara is traditionally made with cheese, pork and eggs (or cream), so not vegan-friendly at all. These ingredients also make it high in saturated fat and cholesterol (so not great for heart health or waistlines either!) In contrast, this creamy, plant-based version that I’m sharing today is actually good for you! Not only is it low in saturated fat and with zero cholesterol, but it also contains a whole host of vitamins, minerals and other plant compounds that promote good health. It is also high in protein, with each serving providing 22 – 29 grams (43% – 58% of the RDA) depending on whether you serve it as three or four portions. And it doesn’t contain any cream, cheese or eggs. Amazing!! 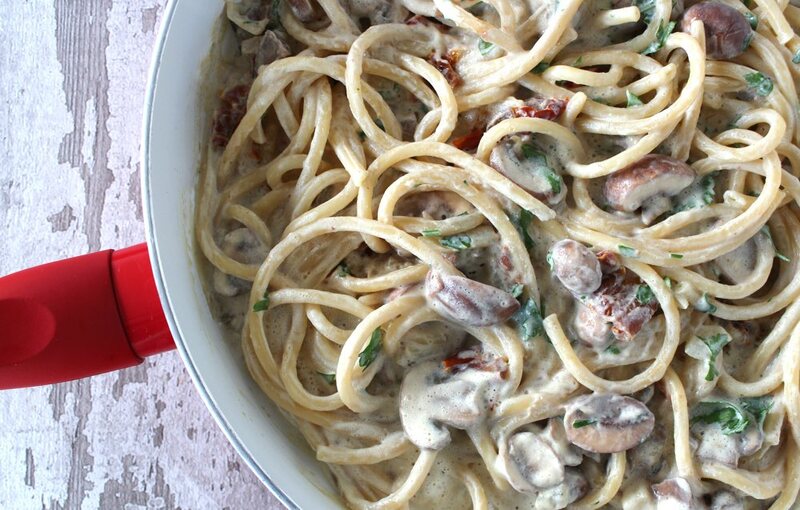 So how do we make a carbonara sauce using plant-based ingredients? 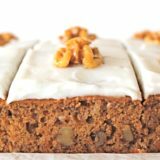 There are a number of ways to achieve this, such as blending cashews or by making a roux using flour and dairy-free vegetable spread. 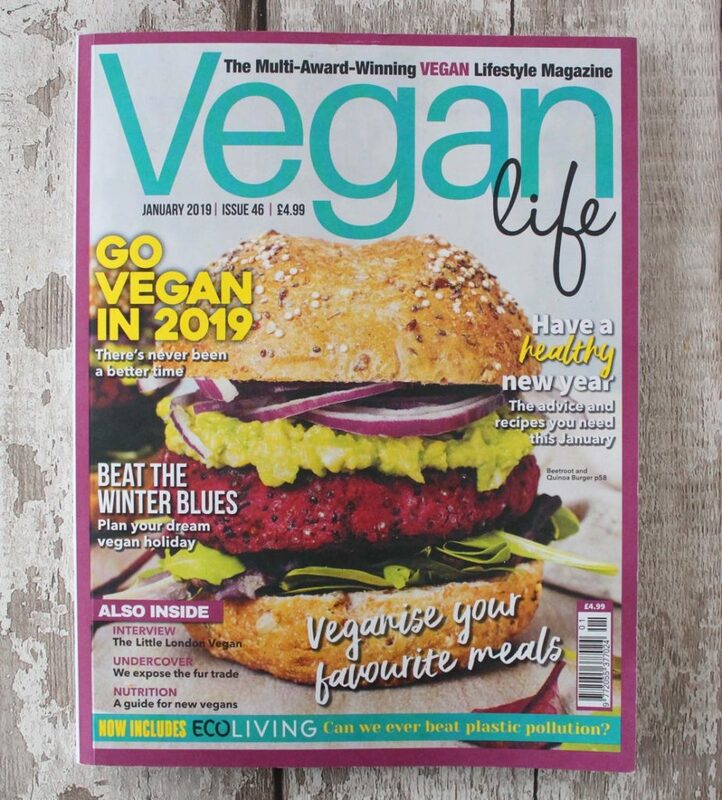 However, inspired by a recipe I spotted in the January edition of Vegan Life magazine, the secret ingredient we used for this carbonara was silken tofu. 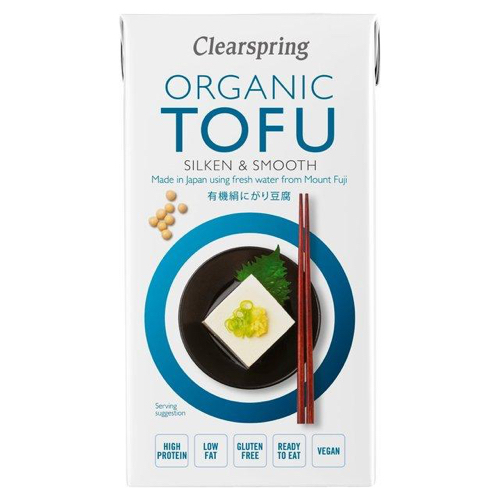 Silken tofu is much softer and creamier than regular tofu, making it ideal for blending into creamy sauces, dips and desserts. 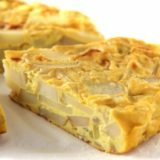 It also makes a great egg replacer for egg-centric dishes like Frittata. Here in the UK, silken tofu can be found in the world food section of major supermarkets (usually with the Japanese foods), as well as Asian supermarkets and health food shops. Traditional carbonara also includes pancetta (cured pork belly) or guanciale (cured pork cheeks). Incredibly, there are vegan pork alternatives now available in the shops. 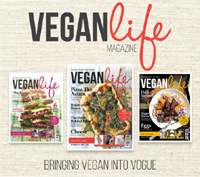 The recipe in Vegan Life magazine suggests using slices of Quorn Vegan Smoky Ham Free Slices. If you’re into meaty flavours and textures, this kind of option would definitely be worth trying as a healthier, cruelty-free alternative to pork. My family opted to use slices of sun-dried tomato instead. 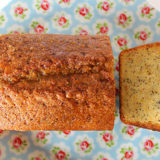 This worked well, adding bites of rich, savoury flavour and chewy texture. Mushrooms also work really well in this pasta dish, adding extra savouriness and chewy texture, so don’t hold back if you’re a mushroom fan. I used baby chestnut mushrooms sliced but I imagine that shiitake mushrooms would work great too. While spaghetti is the most common pasta used for carbonara, you can basically use any kind of long pasta. I used bucatini, which is like spaghetti but a bit fatter and hollow. It’s great for soaking up sauces plus you can whistle through the long tubes which is a bit of a novelty. 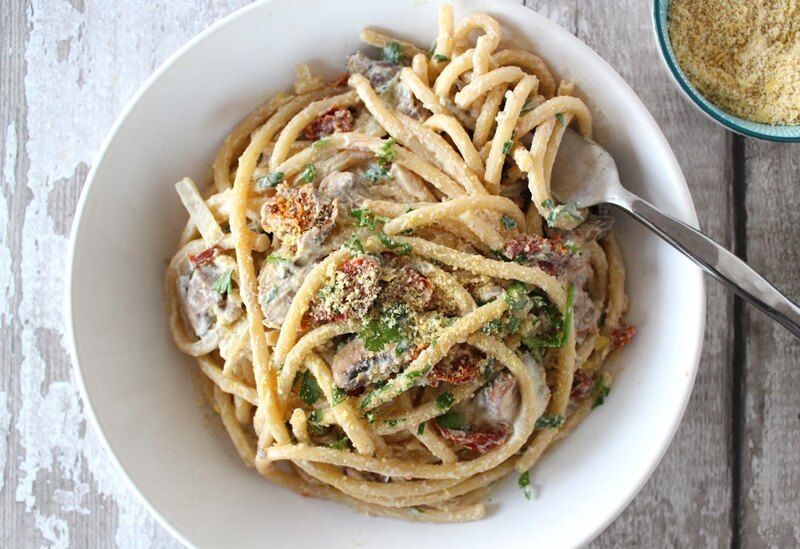 This vegan twist on the traditional dish ‘Spaghetti Carbonara’ is perfect for any night when you need a quick, easy meal on the table. 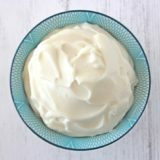 Not only will it rival its traditional counterpart when it comes to creamy deliciousness, but it beats it hands down when it comes to nutritional goodness. It’s been a big hit with our family and we hope you love it too! 1. Heat a large pan of water and cook the pasta as per the instructions on the packet. 2. Gently heat the oil in a large, deep-sided frying pan (skillet) and add the onions. Slice the mushrooms and add them to the pan. 3. Place the silken tofu, milk, vegetable bouillon powder, garlic powder and nutritional yeast flakes in a blender and whizz smooth (alternatively use a bowl and stick blender). Pour the sauce into the pan with the onions and mushrooms and stir through. Continue cooking at a gentle simmer. 4. When the pasta is ready, drain and add it to the frying pan. Add the sun-dried tomatoes and chopped parsley and stir through. Season with salt, to taste. 5. Serve in warm bowls with a sprinkling of chopped parsley and vegan parmesan. We also love to add some roasted broccoli on the side for extra goodness. 6. 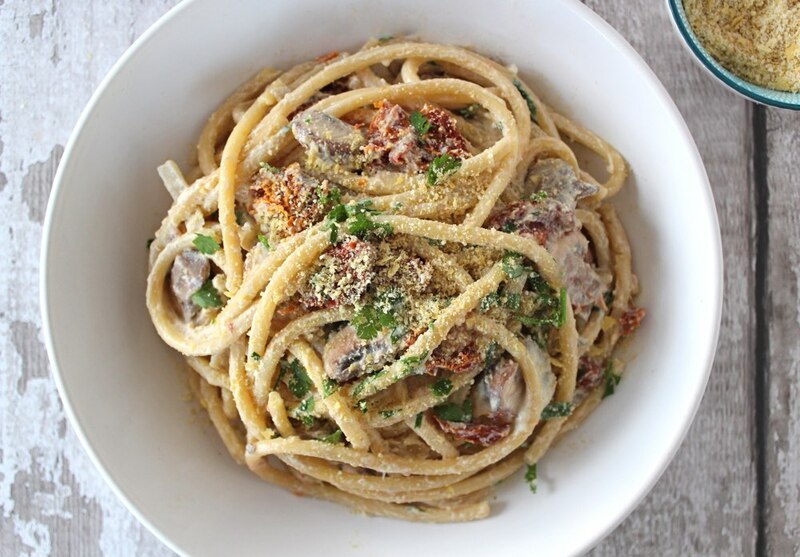 If you have used a wheat pasta, any leftover carbonara can be stored in the fridge for 24 hours. Re-heat in a large frying pan (skillet). Add a generous splash of plant milk to refresh the sauce. Stir regularly until heated through evenly. Alternatively, you can store the sauce separately in the fridge for 3-5 days and cook the pasta fresh. (I haven’t tried freezing it yet but I will report back once I have done so). This dairy-free ‘parmesan’ uses just two nutrient-rich ingredients which are ground together to make a cheesy, savoury condiment that’s perfect for sprinkling on pasta dishes. Place the ingredients in a mini food processor or chopper and pulse into fine crumbs. Store in an airtight jar in the fridge, where it will keep for weeks. 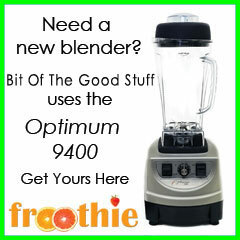 And just before I sign off, if you’re on the look out for a new blender, Froothie has got some fantastic offers available in their January sale 🌟 For making the carbonara sauce and vegan parmesan in today’s recipe, I used my Optimum Nutri Force Extractor, which is a great little blender for whizzing up sauces and smoothies, as well as grinding nuts, etc (you can read my full review here). It retails at £179 but is currently on sale for £99 with free delivery. PLUS you can use my ambassador code AMB20 at checkout to receive a further £20 off!! 💫 This discount code can be used to purchase any blender, juicer, vibration plate and pressure cooker on the Froothie website. I hope you’ve had a great start to 2019 everyone! 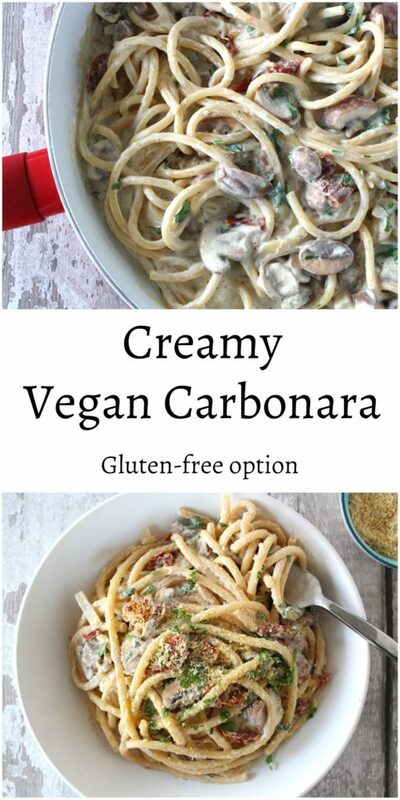 And if you make this Creamy Vegan Carbonara (or any other recipes on my blog), I’d love to hear your feedback and any suggestions for adaptations! 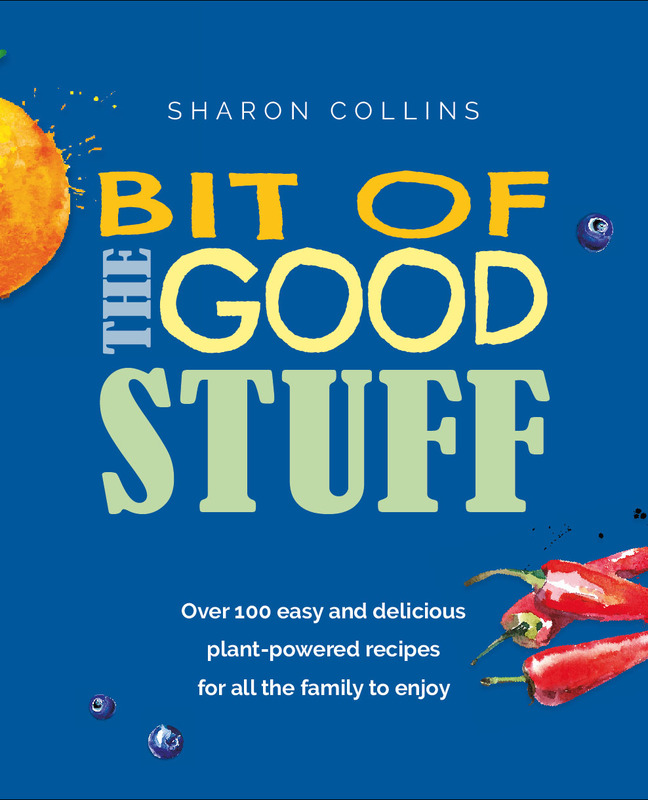 Tag your photos with #bitofthegoodstuff on social media and they’ll find their way to me. 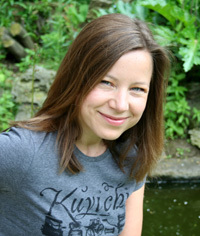 You can also connect with me on my social media channels here: Instagram, Twitter, Facebook, Pinterest. Delicious!! 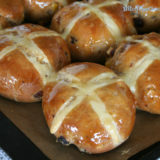 So quick and easy to make too!!! Yum! This looks like a great dinner for a date night! Somebody at work today brought in carbonara for lunch and made me VERY hangry, I’m so glad you’ve given me a yummy-looking vegan solution! 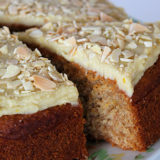 Plus so much healthier and lower in fat and high in protein – must eat now, nom nom.